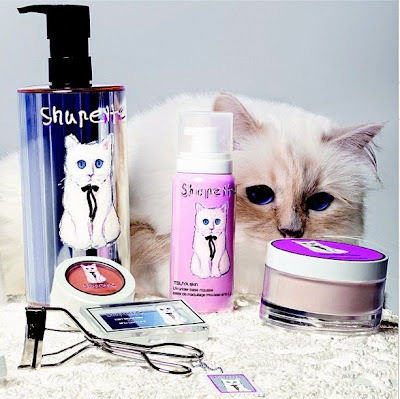 The Shu Uemura Shupette collection by Karl Lagerfeld will be exclusively launched at their Omotesando flagship boutique in Tokyo for one day only on 6 September in conjunction with the Fashion Night Out event by Vogue magazine. The collection will officially launch at all counters on 1 November. Pic from Karl Lagerfeld's Instagram. Dear Iris, thanks so much for always keeping us up to date with the latest releases in Japanese makeup (and others),I barely ever comment but you're my no.1 source for news and photos. I miss reading your makeup reviews and seeing photos of your loots but I guess being a mommy now is keeping you busy enough. Thanks for everything, and please don't ever stop posting! Thank you for the kind and heartwarming comment. It's been tough juggling being a working mom and trying to keep this blog going. I miss sharing product reviews but the reality is that I just don't have the time now, especially with my son becoming more and more active and demanding with each week. It really makes me happy to know that the effort that I put into the blog is appreciated, and I hope to keep it up. Thank you for reading!